Podere Le Boncie is situated at altitude of 300-350 meters in San Felice in Castelnuovo Berardenga, in the southern tier of the Chianti Classico zone. Giovanna Morganti cultivates 4.3ha(original 3ha are in Chianti Classico and recently acquired 1.3ha are just outside of Chianti Classico area) and these vineyards are being managed by the general principles of the biodynamic. She planted more than 7,000 vines per hectare(it is remarkably high density) and it is dedicated principally to Sangiovese, and others are Foglia Tonda, Colorino and Mammolo. Fermentation occurs in traditional open-topped wooden tanks which were specially ordered small one(fit to her body size) to do "pigeage" much easier and appropriately. Le Trame is the finest cuvée and little sister is 5(cinque). 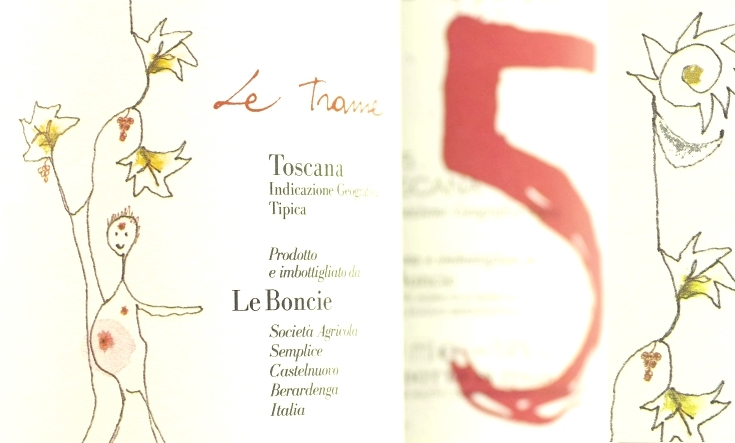 The name of 5 is derived from five grape varietals which used to produce good Chianti Classico in the past : Sangiovese with Colorino, Mammolo, Foglia Tonda and Ciliegiolo. Today all her wines are released as I.G.T.